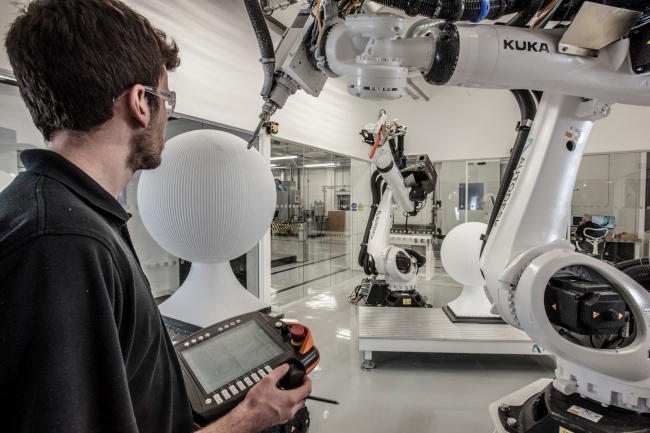 Autodesk has opened a new Advanced Design & Manufacturing Facility in Birmingham. The first of its kind in Europe, it houses advanced manufacturing tools and is a space for Autodesk to collaborate with customers; helping them bring their visions to life, solve some of their biggest challenges and push the boundaries of fabrication techniques. 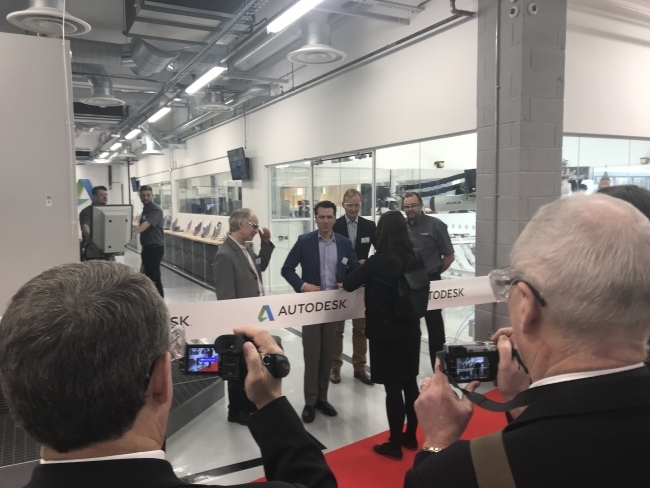 The Birmingham facility is one node in a network of six technology centres around the world that bring Autodesk together with our customers and partners to reimagine the relationships between software and hardware, machines and materials. 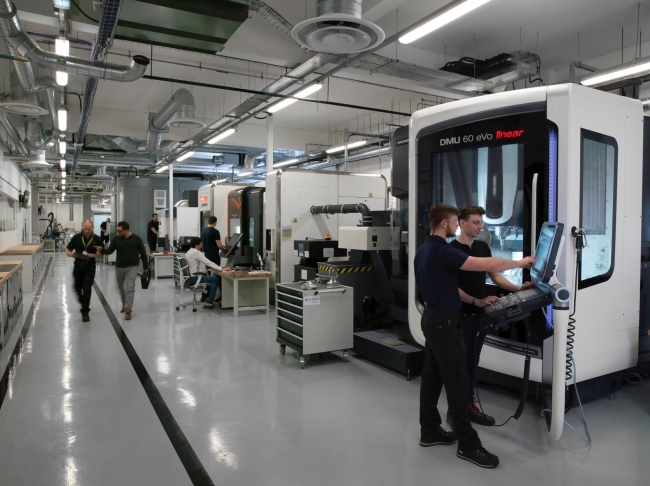 Autodesk has already invested millions in the Birmingham area, following the acquisition of Delcam in November of 2013 and, with it, a portfolio of leading-edge CAM solutions. Building on this capability, the new multi-million-pound facility has been kitted out with high-tech machines including those from from DMG Mori, Hermle, Steifelmeyer and Hamuel, as well as robots from ABB and KUKA Robotics. From hybrid manufacturing to human-robotic collaboration, and clay milling, customers and partners, both large and small, can explore a range of techniques to see how they can benefit from the future of making things. In short, it’s the factory of the future made real now. The tech centre also houses a lab to ensure data is at the heart of projects. Engineers will be able to view data collected from smart machines; better connecting design and manufacturing processes, so that decisions are more informed, and projects are delivered more efficiently. At the opening this week, visitors saw how Autodesk’s just-released cloud-based Fusion Production software can monitor, analyse and manage data produced from live fabrication process on mobile devices. BMW and GKN Additive are just some of the companies that are working with Autodesk engineers at the Birmingham centre. With AD9100D certification, the team is also able to take on specialist aerospace projects too. As well as working with customers, the centre will be made available to the local education community, to highlight how manufacturing has been transformed by new technologies and inspire the next generation of engineers and product designers. Through Autodesk’s work with the STEM Ambassador Network, members of the Birmingham team will also work with a range of academic institutions, including all local universities and research facilities, such as the MTC in Coventry. This will include involvement with specific projects and student competitions, such as World Skills, F1 in Schools and VEX Robotics. Additionally, the STEM ambassadors will be on hand to help teach students skills such as coding, offer mentorship for career opportunities, and judge events and competitions. This launch is also part of Autodesk’s aim to help Britain reclaim its place as a global industrial powerhouse. It founded the Future of British Manufacturing Initiative (FOBMI) in 2016, alongside partners, to help the industry take a hands-on approach to 4IR. It also recently launched a new manufacturing manifesto – Enabling the Art of the Impossible: How Britain can lead the 4th Industrial Revolution – which outlines steps to provide more support for Britain’s smaller manufacturers.